Being able to Green Clean is one of the easiest components of living green! It not only saves money, but it saves the environment of the entire planet we call HOME. And if you knew that using Earth Friendly Cleaners could save you thousands of dollars, i KNOW you could get excited!!!! In today's Financial Crisis, ''The Credit Crunch,'' saving hundreds, or even thousands of dollars each year on your household cleaners could save your budget!! Click this link to see Green Clean on OPRAH! Green Clean Kits is one of the most powerful ways an individual can make a HUGE difference in the dilemma in which our planet finds itself in today. FOUR times in 2007, Oprah presented this as one of her favorites; millions of people agree! This Green Clean Kit has been seen by close to 150 million people, and has been recommended by cultural giants like Oprah and Rachael Ray, as well as best-selling authors from David Bach to Colin Cowie. You may have seen us in hundreds of places including magazines such as Better Homes & Gardens, TIME, Real Simple, Family Circle and FAST COMPANY or on news programs like “TODAY”, “CBS 2 Chicago” and “KTLA FOX Los Angeles.” In fact, according to Nielsen Buzzmetrics, THIS is one of the most popular brands currently discussed in connection with sustainability! And here are a few of the numerous reasons to go with this Environmentally Responsible Green Clean Company!! I would love to share what I have learned over the past nearly 4 decades; some of my favorite ways to use the Green Clean products, some tips for saving even more water, even more money!!!! I look forward to hearing tips from you too!!! And what can one person do? What can one family do? PLENTY!!! When I look back over the 35 years of using these fabulous Earth Friendly products, and estimate the global impact this decision has made, I jump for joy!!!!!! I personally have eliminated at least 2 TONS of waste from entering landfills. What is one of the biggest wastes? Shipping water in containers that also have a little bit of cleaner attached........ The Green Clean I have chosen to use all these decades is SO concentrated that I add my own water!! I personally have eliminated over 4 TONS of greenhouse gas from entering our atmosphere.......... and thankfully, having been off-grid those same decades, the impact is even greater!! I'm not a rich person, I'm not a rocket scientist or brain surgeon....... I'm just a simple, ordinary human being who had, and has, a passion for helping the Planetary Cause as much as I can. PLEASE JOIN ME!!!!!! Fabulous Organic Cleaning Wipes ---Make Your Own! Even though these ready-to-use wipes are economical, nothing can compare with my ''home made wipes'' which cost a fraction of a penny with each use! After throwing out common household cleaners, Roger discovered the S. Corporation, a company that had been producing natural cleaning products for 50 years. Sloan and Roger began using these eco-friendly cleaners inside their house. "We thought they worked terrifically," Roger says. "The great news is that Spencer has never had to go back to the hospital since we switched our products and that really speaks it all for us." The Barnetts liked the products so much, they bought the company! Now, Sloan says she tries to live in a way that's responsible to the health of her children and to the health of the planet. S. products, which include everything from dryer sheets to stain removers, are made from pure ingredients and won't leave your house smelling like a lemon tree. "Clean, real clean, doesn't have a smell," Sloan says. "Real clean is good for our children, good for our families." To help other families go green, the Barnetts are giving every member of Oprah's audience a ''green clean kit'', which includes more than a dozen different products, and they're offering viewers a special 33 percent discount for one month! You can also get a 15 percent discount on other S. products. Oprah says she's a big fan of S.s Organic Super Concentrated Cleaner. "Use a couple of drops of this, and it's amazing," she says. "You can clean the windows. You can clean the counters. … You can clean everything!" ~~~~~~~~~~~~~~~~~~~~~~~~~~~~~~~~~~~~~~ My friend Junette has put together this fabulous Dr.Oz page; read more about his anti aging suggestions! Approx. 14"L x 7"W x 16"H w/7-1/2"L strap drop. 100% natural - made solely from botanical sources and are free of any additives or preservatives. 55% linen, 45% cotton. 100% jute handle. 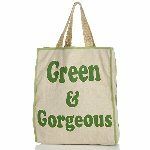 This Green and Gorgeous 100% Natural Tote is a fabulous addition to your Green Clean lifestyle!!! Have A Great Story About These Great Green Clean Products? I bet these Green Clean products have worked wonders for you; please share with everyone so they can experience it too!